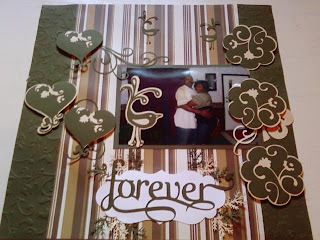 I did this layout for stuck on u sketch challenge # 3. This is my first time entering a blog challenge and I must say I really enjoyed it! This layout actually changed three times. Every background just was to busy! Anywho, I hope you like it. Hi there! Thanks for the lovely comments on my blog and for following! I'm now one of your fans too! Love this layout and I love playing in challengs when I can fit them in! Have a blessed day! Oh, I'm soooo glad that you are playing along with us this week! Great take on the sketch .. you used some of my favorite cuts! Just overall wonderful! Thank you so much for joining in on the fun and I can't wait to see your take on the next sketch..
so happy you joined in on the fun....your layout is lovely...the colors are fab and I love the embellies you chose...this turned out beautifully...goood luck on the blog candy....pop over to my personal blog for a chance at some more fun candy!!!! this is awesome!!! I Love what you did...and what a great start to a challenge...I am enjoying them so much more then I thought..I am totally brand new to sketches! again, great job!!!! !